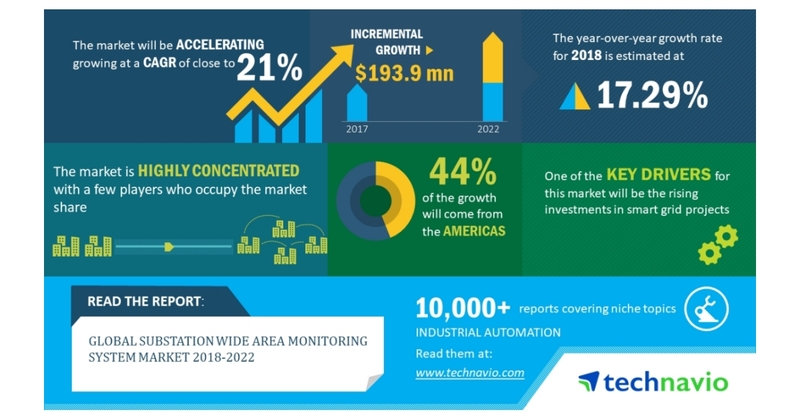 LONDON–(BUSINESS WIRE)–According to the latest market research report released by Technavio, the global substation wide area monitoring system market is expected to accelerate at a CAGR of almost 21% during the forecast period. The rising investments in smart grid projects is one of the key factors triggering the growth of the market. This research report titled ‘Global Substation Wide Area Monitoring System Market 2018-2022’ provides an in-depth analysis of the market in terms of revenue and emerging market trends. It also includes an up-to-date analysis and forecasts for various market segments and all geographical regions. In 2017, the Americas accounted for 47% of the global market and is projected to decline to 45% by 2022, exhibiting almost 2% decrease in market share. The substation upgrading projects in the US are one of the major trends being witnessed in the market. The aging infrastructure in power transmission applications is supporting the increasing adoption of advanced solutions to enhance efficiency in power transmission. The developed economies such as the US have created plans to rebuild or upgrade the aging infrastructure in substations.